Bonfire Adventure has denied that it used viral chokora couple to get millage online. Couple Sammy Githae aka Blackie and his wife Virginia Njeri are back to the streets again. 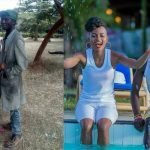 The two became internet sensations after a local photographer called Muchiri, shared transformation photos of them after a Valentine’s shoot back in 2018. Several companies jumped on the trend including Bonfire which gave them a fully paid for trip to Diani but in a recent KTN interview, the couple said that they are back on the streets because they can’t make ends meet. “He only paid our four months rent. After the four months elapsed, things became tough for us. We couldn’t secure a job to pay rent.” said Blackie adding that he usually gets depressed whenever he looks at the photos. “When I look at the photos, I remember that journey and I fall into depression. The situation becomes worse when my colleagues laugh at me saying even if you go leave and fly anywhere, you will always come back here.” Lies Bonfire’s Bonfire co-founder Sarah Kabu however, denied the report saying that the company helped the couples for six months. “I don’t like lies by KTN journalist the street couple went for the holiday na photos ziko online… we paid 6 months rent and gave them cash to start a biz. I don’t know what else they want we cant feed them forever! They were also given a job at kericho and they turned down the offer. Githeri man was ever drunk and his voucher is still open. From now henceforth let me not see anyone tagging me in a post to give a holiday to anyone being celebrated online… everyone knows we keep our word. All photos online.” she said. The post Bonfire Adventures denies that it exploited chokora couple to further their business appeared first on Ghafla! Kenya.